Debra brought along Ju Zhang on Tuesday night and this is his pitch. The team at FormusLabs were super efficient, having their video already submitted before Tuesday night. Consequently, the DD Vote is well underway, 13 votes already cast. The GO/NO-GO decision is not far! Enke was one of the three female Angels in the Dirty Dozen that founded Flying Kiwi Angels in 2014. When she left us to do an MBA in the US, Arron took over her portfolio and her angelic role. Standing on the shoulders of giants or walking alongside growing giants, both are a great honour. All the best to Enke on her onward journey! Sadly, the full article sits behind the Wall Street Journal paywall. "Marvelous! As my first official act, I am going to be teaching six two-hour sessions at Kamo high school today and tomorrow about the need for technology aware artists." Centrality is all about blockchain and is put on an accelerator to grow its app ecosystem. They are leveraging Lightning Lab know-how and have hired can-do man Jeff Mann to run it. Learn more about it, Tue 4 Dec 2018 @ 1800 in Auckland. Pls RSVP! Yabble didn't stop after we stopped DD, they are now incorporating BC tech. Some may remember CarbonClick, Jan and Paul impressed us at ADI back in July. Your Chief Cat Herder has battled with a bigger cat than usual over the last few days. All FKAngels can be reached by an email consisting of their first and second name on the fka.nz domain. So far, so good. After angels reported missing emails, he went out hunting and turned up a rogue spam filter at the fka.nz domain. All fixed now but some of you may have received a confusing backlog of emails as a consequence. Funny but not surprising to many, rb@fka.nz was flagged as the top spammer on the fka.nz domain. When recording the 2018 Xmas song the Board also recorded this one. We hope you like it! If you do, like it on LinkedIn ? The ecentre aka Jackie is inviting you all to this talk of MYOB's resident futurist KeranMcKenzie. Contrary to popular belief, he will not be talking about the future of ironing nor will he give styling advice. Check out the B:Hive coworking space on the North Shore and hear him speak. ☞ Read more and register here. Next Tuesday, 20 November will be the last pitch night with investment pitches in 2018. Sad but true. Debra is bringing a startup with a proposition that is going to the bone, literally. Come and see for yourself! 18:30 @ KPMG, 18 Viaduct Harbour Ave, Auckland. If his startup is called Horn, does that make Lawrence horny or is he just crazy, chasing a fully horned unicorn after a near miss? Ask Jackie, Martin or Rudi who have all spoken to him and everyone feels there is a good mutual fit. Lawrence has already been helping Martin with ADI Whangarei over recent months. With Tim Warren, we have at least one other Angel who had red hair at some point and a photo to prove it. But seriously, if you know of any material reasons why Lawrence should not join our group, now is the time to speak up! Raise your concerns in confidence with the FKA Directors. The eight-company pitch in Whangarei on Monday was a great kickstart of the Northland startup ecosystem. Some potential Angel fodder there, all helped by Northland Inc, NZTE and AANZ. Suse from AANZ was supported by a strong FKA contingent with Jackie, wannabe Lawrence, Martin and Rudi. So strong was our contingent that somehow, the MC Ken Erskine ended up registered as a Flying Kiwi Angel with a big lanyard sign to prove it. But he carried that 'badge of honour' with his typical GSOH throughout the day. CCH says, "Ken would make a fine first Scotsman in our ranks." Techion, our Portfolio Company #7, has made TV news with the role that the Techion tech plays in the Starworms Project of the Bill & Melinda Gates Foundation and the World Health Organisation (WHO). ADI Auckland and ADI Queenstown were running neck on neck this week, each with four bookings. Julian had one for ADI Hamilton. And here some email feedback that Cornelius received, not for his good looks, "Thanks for the great questions, we’ve not yet met people with your sort of background in the investment space...". You are invited to join friends and colleagues for end-of-year drinks and canapés at 5:00pm on Wednesday 5 December at the offices or sun deck of EY on Takutai Square in Auckland. It’s been "pedal to the metal" all year in angel investment so please join us to celebrate the excitement and traction founders and investors are generating in New Zealand. Kindly RSVP to Karren Hmm, red wine, one way to drown starworms! Robyn Grace is a Kiwi filmmaker and knows Moxion from productions such as Ash vs Evil Dead and The Shannara Chronicles. She is raising money on Boosted to shoot a new short and wants to use Moxion. Her partner Rory MacGillycuddy has co-hosted Ask Angels Anything with Rudi and devised the cheeky fundraiser slogan. Says Rudi, "Fund Moxion, then Robyn and tell others! I'll send out the full co-investment call for Moxion early next week.". The number of new startups in AUS is going down. More quality over quantity? The reason why Aussie VCs keep following the NZTE invites to see Kiwi startups? Read more about in the Startup Muster Report. Ralf, the champion of Kademi, has finally got a clear remit to commence DD with 80% in favour. Steve from Auckland and Alan from the UK have already volunteered to help. But Ralf would welcome another one or two brains to help examine Kademi's business model. About time you did some DD? Then get in touch with Ralf.Wittgen@fka.nz !!! Laika was the first dog that was sent to the moon in 1957 by the Russians. 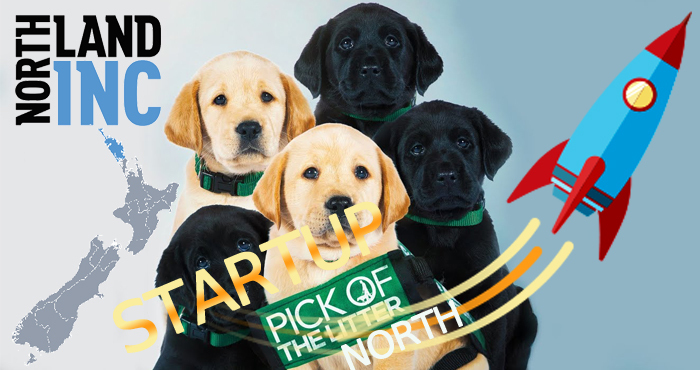 Now NZ's Northland is following that lead and is picking 8 of its startup puppies to shoot for the stars. Rudi is hitching a lift with NZVIF's Bridget ex Riverhead. Still room in her People Mover for more Angels. Wow! What a busy ADI week this has been. Monday 4x founders in Wanaka, Tuesday 4x Whangarei, Wednesday 1x Takapuna, and Thursday 3x Auckland. That makes 12 founder conversations just this week! Another cohort of GLAM (Galleries, Libraries, Archives and Museums) startups will reach its final climax in a GLAMACTIC Showcase in Wellington on Monday 3 December. Debra and Rudi brought back heaps of learnings from their trip to China. One of the many things others missed out on was an opulent nine-course meal prepared by a Michelin Star chef and generously hosted by George from Zino Ventures. 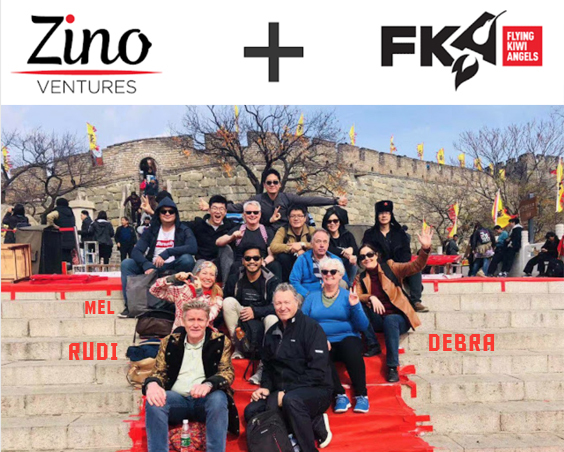 Mel, the CEO of Geo AR Games and currently still held in DD suspense, was also on the trip and has written this blog on "Taking your start-up to China". Little known fact: In China, a boy becometh a man only when he walks on The Great Wall. The Zino folk delighted in citing this proverb on the day and for days after.